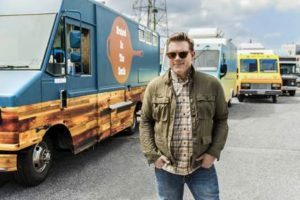 The Great Food Truck Race returns to the Food Network August 20th for a six-episode cook-off featuring seven teams of food truck novices battling it out for the $50,000 win. Dallas will bring the heat to the battle with Mr. Po’ Boys (Cedrick McCoy, Ryan Thompson, Esther Torres) hailing straight from the Big “D” to attempt the win. Hosted by Tyler Florence (pictured left), the teams embark on a culinary adventure — Southern-Style — traveling from New Orleans to Savannah, complete with beautiful scenery, landmarks, and of course, intense food challenges to liven up the trip. 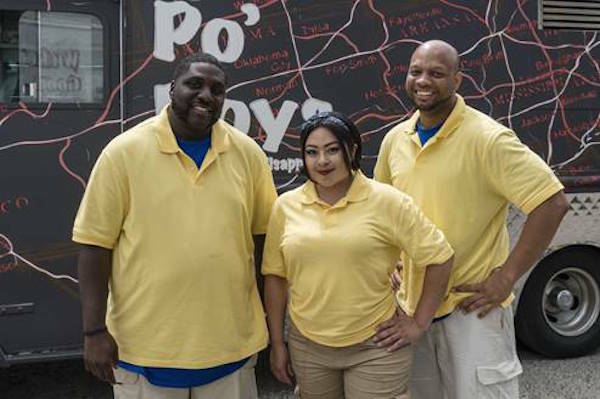 While all is fair in love and food wars, we caught up with the tag team trio of Mr. Po’ Boys, who kept it light and ultra-spicy on their new Food Network appearance, future plans, and of course lessons learned. Because they can dish it up and serve it, keep reading on for the latest in Inspire N Style scoop. Mr. Po’ Boys’ Ryan Thompson was in it to win it this season, plainly stated. Boldly yet humbly claiming that Mr. Po’ Boys was the better team, food truck teammate Esther Torres sized up their competition from the start. With The Breakfast Club team out of Philadelphia, Papi Chulo’s Empanadas out of New Jersey, The Southern Frenchie fresh from Little Rock, Stick ‘Em Up hailing from Tennessee, and Wicked Good Seafood emerging from the East, it’s clear that the pressure was on for Dallas’ own to claim the title for best Southern fare. And just what was their strategy? “Cedric and Esther came up with a lot of crazy recipes,” Ryan Thompson admitted. “If they gave it to me, I’m going to go back and sell it.” And there you have it. While a whole lot of crazy may have sprinkled its way into strategy, all is not lost as the po’ boy trio will bring a taste of the competition back to the Big D.
From brisket sandwich beginnings at The Farmers Market to Po’ Boy pioneers, is there anything that this close-knit crew can’t dish? Well, the ending to the show of course. But from our radar, we have a feeling that a favorable outcome may await. 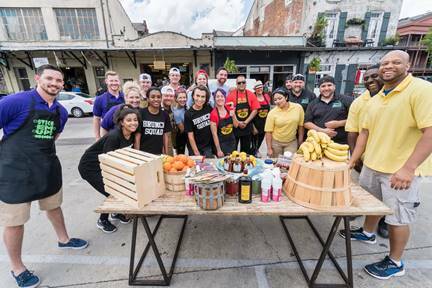 Regardless of the finale, it is evident that a future restaurant by the Food Network stars may hit the Dallas #foodie scene as early as Fall. With $50,000 possibly in tow, the crew jokes as to what they would do with the earnings if they win. “Cedric wanted to go ahead and start a restaurant, and I wanted to go to the Bahamas,” Ryan joked. 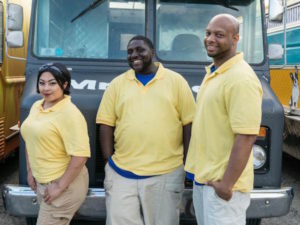 With Esther as a single mom, and both Cedric and Ryan hustling for restaurant real estate –the trio vows to take it one step at a time while basking in the glow of their Food Network appearance. New merchandise, seasonings, and sauces are steadily trickling down the horizon but for now, serving up the ultimate in crowd favorites, such as the sweet and spicy shrimp po’ boy, seems to steer their focus. Imagine – a warm, toasted baguette drizzled with homemade tartar sauce, stuffed with grilled blackened shrimp, seasoned with Mr. Po’ Boys own blackened seasoning, and topped with picked red onion slaw. Yum! Albeit this po’ boy breathes victory all on its own, it will take more than blackened seasoning, grilled shrimp, and red pickled slaw to chart the win. Regardless of the end, lifelong lessons, friendship, and business takeaways gave depth to the overall experience. The Great Food Truck Race premieres Sunday, August 20th at 9pm ET/PT and the winner will be named in the season finale on Sunday, September 24th at 9pm ET/PT.